SAS used the ConnexMe (http://bit.ly/1WEE3kB) platform, by the organizer Evenium, as a way to communicate the agenda and with the possibility for between-participants communications. As a smartphone application, not simple to explore but works ok as is.The event occupied a smaller area on the 2nd floor and used the adjacent rooms for presentations. As I do not know the SAS team in Paris so I did not have direct interactions with SAS France either. The event occupied a smaller area on the 2nd floor and used the adjacent rooms for presentations. As I do not know the SAS team in Paris so I did not have direct interactions with SAS France either. Cloudera is one of the uprising start-ups on the Big Data arena. 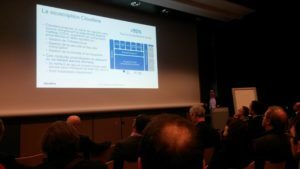 Jérôme Campo exposed well the Cloudera message as being the “Analysis tools for expanding professions”: Operations, Marketing and Production. The DD&A has the objective to permit the user to have an iterative process in order to understand how to carry out the data-mining but also to understand his own data. Architecture: Cloudera is based on and built on what the market would name as a “modern” architecture for database mining and Hadoop friendly thus using the Hadoop elastic file distribution system. This permits a quick implementation of data while being less limited of own IT architectures. The vision is to connect with other systems: Cloudera has a focus to render the user experience of the Cloudera platform to not really see the difference (!) when connecting other systems, tools, and databases (speed, usability). This has always been the challenge for data-warehouse-systems. In the case of Cloudera this is based on the platform being a hybrid Open Source. Cloudera was created in the year 2000 and they are today about 1000 people with 10 people in France. 200 people are engaged in 24x7 schemes for support. 2/3 of R&D works on Open Source development. Cloudera is also a member of the Apache consortium. 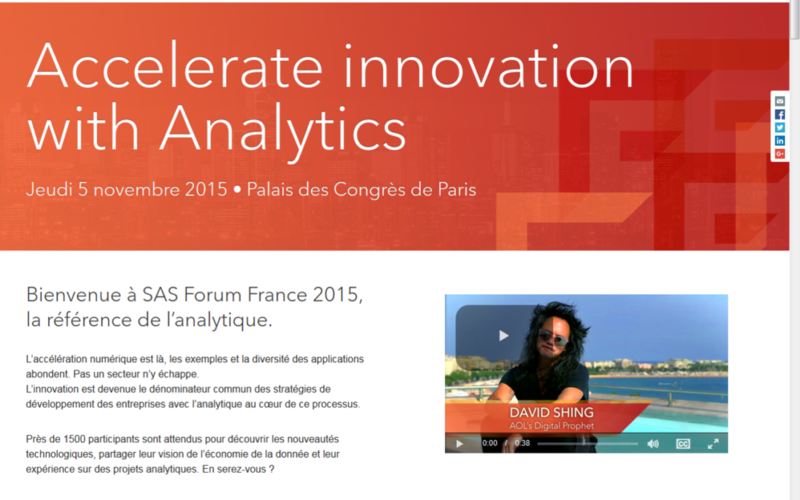 SAS and Cloudera work together since 2013 and already have joint-solutions at certain clients. The SAS solutions are able to extract data seamlessly from the Cloudera Data Hub platform via a couple of tools, though. Jérôme also mentioned one partner-client I really found interesting (as I work on energy monitoring issues in the data centre industry), Ameren (www.ameren.com): They offer to empower energy users by giving them access to analytics tools to both measure and optimize their energy consumption. 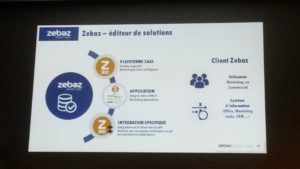 Nicolas Millet at Zabaz, a French “start-up” in the field of big data for marketing leads generation, presented their current solution. The Zebaz solution offers business operations access to data and to accommodate data to assist the sales teams in their prospection process. They use 36,000 information sources for company changes, people changes, market information and news etc. One major task, and the challenge for this big data solution, is to render all the data into identifiable companies and individuals. Their main offer is “Z360” and is the access to the Zebaz platform. 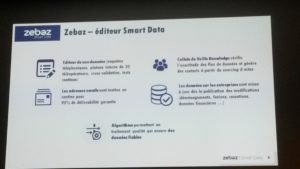 Nicolas did also expose three business cases with named companies (Dybatrace, Equinix France and Nuance France), which I always find encouraging as many companies do not. However, they did not explain in which way the Zebaz platform works with SAS, but perhaps not a critical subject. It should be noted that I am independent of the above companies and information given are my own interpretations and understandings.